Is there a better alternative to MacTimeLog? Is MacTimeLog really the best app in Applications category? Will MacTimeLog work good on macOS 10.13.4? 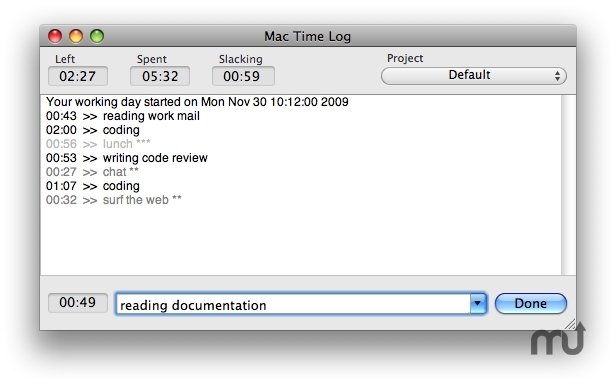 MacTimeLog is a simple time tracking tool for Mac OS X. It's written in Python, using PyObjC interface to Cocoa, it's completely free and released under GNU GPL License. It helps you to track your working and slacking time, you can easily know how much time you spend on work, and how much time you spend on not work related activities, i.e chatting with friends, surfing Web for fun. Version 0.2-b3: Release notes were unavailable when this listing was updated. MacTimeLog needs a review. Be the first to review this app and get the discussion started! MacTimeLog needs a rating. Be the first to rate this app and get the discussion started!